Binghamton University is regarded as an impetus for the revitalization of the city of Binghamton, Johnson City, Vestal and the surrounding areas. Recently, the city of Binghamton has been set on the path toward becoming a prominently health care- and education-focused city. Moreover, BU is the primary factor contributing to the surrounding area’s recent economic progress. According to statistics provided by the city of Binghamton, higher education in Binghamton, both on a public and private scale, accounts for around one of every 12 jobs in the area. More specifically, each year, the University has an influence of over $1 billion on the region, produces over 250,000 visitors, provides approximately 12,000 employment opportunities and contributes to 12 percent of the region’s gross domestic product. The effect of BU on the surrounding regions are not understated, and consequently, the city of Binghamton has become colloquially known as a “college town.” Towns in close proximity to large higher education institutions frequently prioritize and cater to the needs and wants of the student population, with businesses, real estate and nightlife being centered around student life. The city of Binghamton is no exception. Despite the economic upturn that higher education may bring to a region, the negative impacts of such a prominent influence from local universities and colleges are often trivialized. For example, at BU, most students between their sophomore and junior years move out of the dorms and live off campus to the West Side and Downtown areas of Binghamton. Despite rent usually being considerably cheaper than living in a dorm or University-sponsored apartments, real estate prices are often inflated far past their market price. Because the real estate market is so focused toward students, and landlords are able to charge higher rent, these hiked-up prices can negatively impact the surrounding community, who are also forced to pay these prices. Not only is the rent for residential houses increasing, luxury apartment complexes geared specifically toward BU students are becoming increasingly popular in the Downtown area. According to friends living in these apartment communities, such as 20 Hawley Street, Twin River Commons and The Printing House, they can charge approximately $1,000 a month for a one-bedroom apartment. These price increases make Downtown Binghamton nearly uninhabitable for native Binghamton residents, thereby reserving the area exclusively as a social haven for students. Similarly, businesses frequently allocate financial resources and physical space toward the preferences of students, such as restaurants and nightlife. While such establishments are central to social life in college, especially at universities located in small towns, we must ask ourselves if businesses prioritizing the social life of students (for the sake of making money) is worth not catering to the basic needs of the non-student population. In Binghamton, the West Side and Downtown areas are particularly devoid of grocery stores and restaurants that offer cheap, healthy options. Yet empty storefronts are consistently filled by trendy restaurants like Dos Rios Cantina and The Colonial. Despite the conspicuous benefits that this provides for students, it must be noted that allocating financial resources solely toward temporary residents is unjust, and we must prioritize formulating solutions to combat this issue. 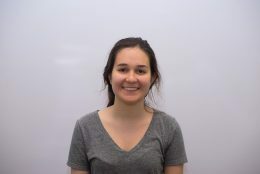 Theodora Catrina is a sophomore majoring in mathematics.